Size doesn’t usually matter when it comes to the area of wooden routers. That is what I came to know with the Festool OF 1010 EQ wood router. This small but precise tool has all it takes to be seen as the best among the top range routers around. It will be only in its use that you come to realise how efficient, beneficial and easy to use this tool is. Made with several user-friendly features, you are sure to get some of the best trims ever. For instance, the whole process of routing will be done with ease through the cutting and release of the bits in use. When compared to the depth found on some of its compatriots, it is clear that the router has been designed with the user in mind. For instance, the router has the micro adjustable depth control mechanism ensuring that it gives some of the most accurate specifications up to the area of 1/256 inches. There is nowhere you are likely to be treated to variety as in the OF 1010 wood router range of products. For instance, this is not an exclusively single brand item but comes in diverse selections. Take the case of the 1010 EQ which is one of the most respected routers around the market. The 2-1/8 inch plunge can only be found with the 1010 EQ which is considered as the smoothest of the help in the maintenance of consistent yet trusted plunge locks. Nothing has been seen to look better than the beautiful design of the OF 1010 EQ wood router handle. The handle has the allowance to allow the user have a full grip in the course of its use thus giving smoother use. 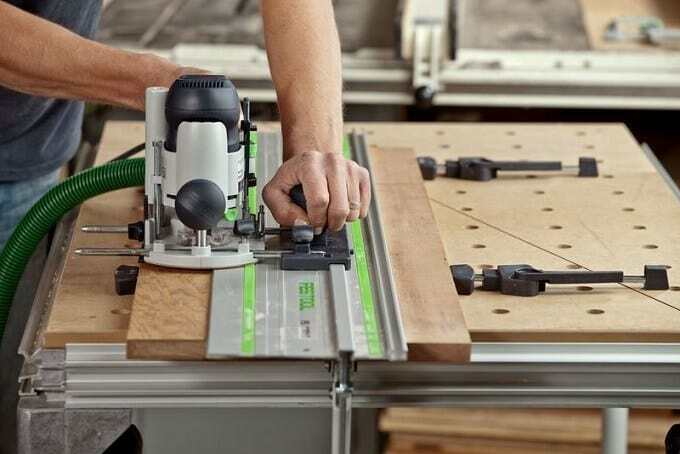 Within the user operation guide which the Festool prepares, the user of this tool has the peace of mind of getting the best feel, easy use and the whole criteria of building any wooden apparatus using this implement. Like in most of the Festool products, this tool is bound to generate some dust in the course of its use. This is why the manufacturer in its sacred wisdom designed the dust extraction mechanism which is also found in the OF 1010 EQ router. The dust extractor keeps the user from the dusty environs and so keeps the health status protected. This router is seen to work well with among others the FS guide rail which has been seen to work with most of the Festool products. Other known devices are the LR32 hole drilling system, the VS600 dovetail jig which is in most cases used in joinery applications. It is no doubt that the manufacturer has done some of the best homework ever seen in this industry with regard to it. This allows the router to be able to be able to work with intense speed. In conditions even when the load being handled is too much. The load is protected by the ability of this router to be able to have some temperature controls. In addition, the ability of this router to operate at constant power range and ease of power use is seen in most cases as the locks up and maintains the router grip. So looking at the OF 1010 router, you get an assurance that is only unique to this router. The user has an assurance that the amount of investment that may go into its purchase is worthy because you will get better returns if you are solely into the business of wood trims. What are the Best Materials to Use with a CNC Router? What is the Ideal Height for a Router Table?